Muhammad Rashid Usman is an Associate Professor at the Institute of Chemical Engineering and Technology, University of the Punjab, Lahore. He obtained his Bachelor in Chemical Engineering form University of the Punjab, Lahore in December 1999 and based on his performance was awarded goldmedal by the university. Soon after his bachelors, he joined the University as a Lecturer on January 24, 2000. 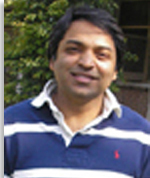 Later, he obtained his Masters in Chemical Engineering from University of the Punjab, Lahore. He spent most of his career, serving the institute. He completed his PhD studies from the University of Manchester, UK and resumed his job at the institute in 2010. He is currently involved in undergraduate and postgraduate teaching and research activities regarding catalysis and reaction engineering. He has received several awards and research grants for his outstanding performance. He has more than 25 research publications to his name. He is member of PEC, PIChE, and NCQT Pakistan. Right Click on the link and Select "Save Target As ... " option and save the file in your PC.